Want to join the Espris De “Corpse” with lively spirits and creepy crowds for a fun local event? Well, look no further than nearby Manitou Springs and the 23rd Annual Emma Crawford Coffin Race & Parade Saturday, October 28, 2017. According to the Manitou Springs Chamber, Emma Crawford, a young woman seeking the mineral springs “cure” from tuberculosis came to Manitou Springs in the 1800’s. Sadly, Emma passed away in 1890. Before passing, Emma asked her fiance to bury her on top of Red Mountain. Her wish was honored, and her remains rested peacefully atop the mountain until 1912. During the early 1900’s, the Louisville and Nashville Railroad Company began building an incline to the mountain top, forcing her coffin to be moved. She was reburied on the south slope of the mountain. After several years of rain and harsh weather conditions, Emma’s remains slid down the mountain into the canyon below, where two young boys found her name plate and the silver handles from her casket. The Parade starts at 12:00 pm followed by up to 70 teams racing coffins down Manitou Avenue for the ultimate victory! Each team consists of one Emma and four runners dressed in costume. The fastest times earn trophies as well as a chance at Best Entourage, Best Coffin, and NEW in 2017: Miss Emma will be crowned, so come dressed to impress! 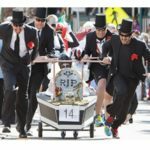 This entry was posted in blog and tagged coffin race, Emma Crawford, festival, ghosts, Halloween, Manitou Springs by admin. Bookmark the permalink.